ملکی, صادق, فائزی‌ پور, مهدی, ابراهیمی, قنبر, لایقی, محمد. (1392). کاربرد مدل رگرسیونی برای پیش‌بینی استحکام اتصال با پیچ روی اعضاء از تخته ‌چندلا بر حسب قطر و عمق نفوذ. مجله صنایع چوب و کاغذ ایران, 4(2), 11-22. صادق ملکی; مهدی فائزی‌ پور; قنبر ابراهیمی; محمد لایقی. "کاربرد مدل رگرسیونی برای پیش‌بینی استحکام اتصال با پیچ روی اعضاء از تخته ‌چندلا بر حسب قطر و عمق نفوذ". مجله صنایع چوب و کاغذ ایران, 4, 2, 1392, 11-22. ملکی, صادق, فائزی‌ پور, مهدی, ابراهیمی, قنبر, لایقی, محمد. (1392). 'کاربرد مدل رگرسیونی برای پیش‌بینی استحکام اتصال با پیچ روی اعضاء از تخته ‌چندلا بر حسب قطر و عمق نفوذ', مجله صنایع چوب و کاغذ ایران, 4(2), pp. 11-22. ملکی, صادق, فائزی‌ پور, مهدی, ابراهیمی, قنبر, لایقی, محمد. کاربرد مدل رگرسیونی برای پیش‌بینی استحکام اتصال با پیچ روی اعضاء از تخته ‌چندلا بر حسب قطر و عمق نفوذ. مجله صنایع چوب و کاغذ ایران, 1392; 4(2): 11-22. Maleki, S., Dalvand, M., Haftkhani, A.R., and Faezipour, M., 2013. The effect of adhesive types and dovetail fitting height on stress carrying capacity of miter frame corner joints constructed of particleboard and medium density fiberboard (MDF), Journal of Forest and products, 66(2): 203-214. (In Persian). Ebrahimi,G., 2007. Engineering design of furniture structure. 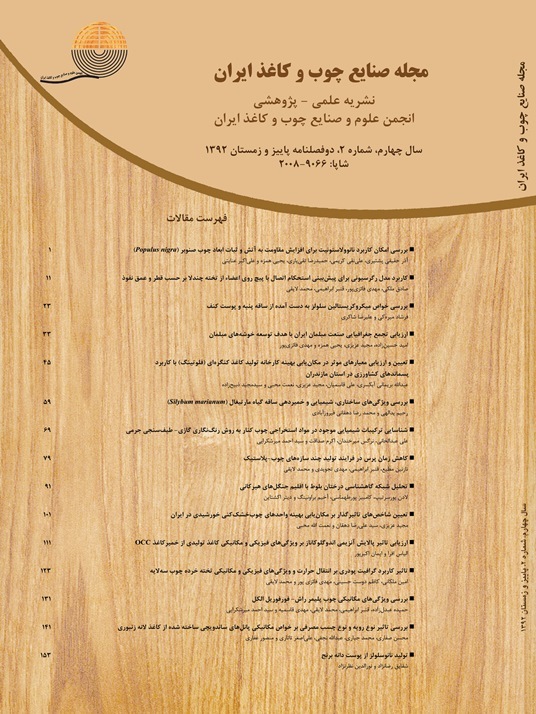 Tehran university publication, 491 Pages. (In Persian). Johnson, J.W., 1967. Screw-holding ability of particleboard and plywood. Forest Research Laboratory Report No. T-22, School of Forestry, Oregon State University, Corvallis, OR.10. Eckelman, C.A., 1975. Screw holding performance in hardwoods and particleboard,Forest Products Journal, 25(6): 30–35. Barnes, H.M., and Lyon, D.E., 1978. Fastener withdrawal loads for weathered and unweathered particleboard decking, Forest Products Journal, 28(4): 33–36. Eckelman, C.A., 1973. Holding strength of screws in wood and wood-based materials. Research Bulletin No. 895, Purdue University Agricultural Research Station, W. Layafette, IN. 15 pp. Rajak, Zaini, and C. A. Eckelman. 1993. Edge and Face Withdrawal Strength of Large Screws in Particleboard and Medium Density Fiberboard, Forest Products Journal, 43(4):25-30. Semple, K.E., and Smith, G.D., 2006. Prediction of internal bond strength in particleboard from withdrawal screw resistance models, Wood and Fiber Science, 38(2): 256 – 267. Eckelman, C.A., 2003. Textbook of product engineering and strength design offurniture. West Lafayette, Purdue University Press, USA, 99 p.
 Miljkovicl, J., Popovic, M., Momcilovic, M.D., and Grmusa, I.G., 2007. Edge screw withdrawal resistance in conventional particleboard and OSB- influence of the particles type, Bibld Journal (6): 109-117. Kasal, A., 2008. Effect of the number of screws and screw size on moment capacity of furniture corner joints in case construction. Forest Products Journal, 58 (6): 36- 44. Standard Test method for evaluating properties of Wood-base fiber and particle panel materials. ASTM D 1037–96. Pp: 137-166. Standard Test Methods for determination of resistance to axial withdrawal of screws, German version, EN 320,1993.